Rethink Food | Indestructible Ideas! As we explore alternatives to cancer treatment we would like to share some resources and links regarding organic diets and book recommendations. Yesterday we interviewed Dr. Zarin Azar, Board Certified Gastroenterologist, Holistic practitioner, and owner of The New Earth Medicine. Dr. Azar invited us to her home, and office in Valley Center, California, to discuss with us her experience as a practitioner of the Gerson Method. 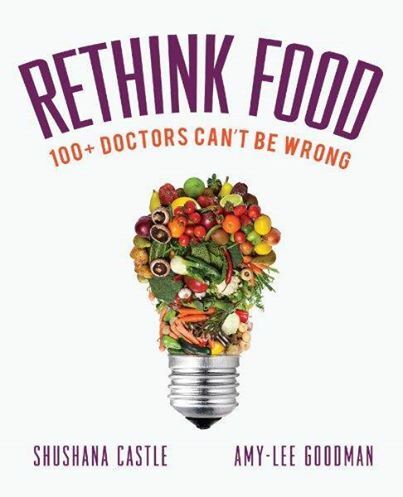 Dr. Azar recently contributed to in the newly released book, “RETHINK FOOD”. The book features 102 doctors from around the world, including New York Times bestsellers, Dr. Neal Barnard, Dr. Caldwell Esselstyn Jr., Dr. Joel Fuhrman, 8 elite athletes and 8 renowned nutritionist. Authors Shushana Castle and Amy-Lee Goodman feel that everyone should rethink food, as there is a great injustice in the misinformation regarding our health. In the history of cancers, diabetes, Alzheimer’s, obesity and heart disease we have never reached such rampant levels of illness. As we explore alternative treatments, we have now confirmed what we already felt; nutrition is a key component to health! Dr. Azar spoke with us regarding nutrition, having a healthy lifestyle, and most of all how that connects to our mental health. Check out the webpage for the book, which is now also available on Amazon.com and on e-readers.